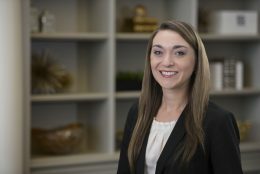 Lauren Haupt is an administrative assistant for Anderson Jones PLLC. She oversees a variety of daily tasks including communicating with clients, file maintenance, social media, billing and mail processing. Prior to joining Anderson Jones, PLLC, Lauren served as an Assistant Manager for Enterprise Holdings, and worked as an Events Productions and Promotions Assistant for Cox Media Group.